As result, the application was started, but I didn't see the map. ERROR/Google Maps Android API(10369): Authorization failure. to enable "Google Maps Android API v2"
Now you are ready to create your own Google Map app with using Google Map APIs V2 for Android. If you create application with min SDK = 8, please use android support library v4 + SupportMapFragment instead of MapFragment. If you are unfamiliar with the Google API console, read the very good answer of Rusfearuth above. Check if the meta-data are present and contain the right key. If you release your app, you need a different key. Do not worry, 99.7% of devices support this. 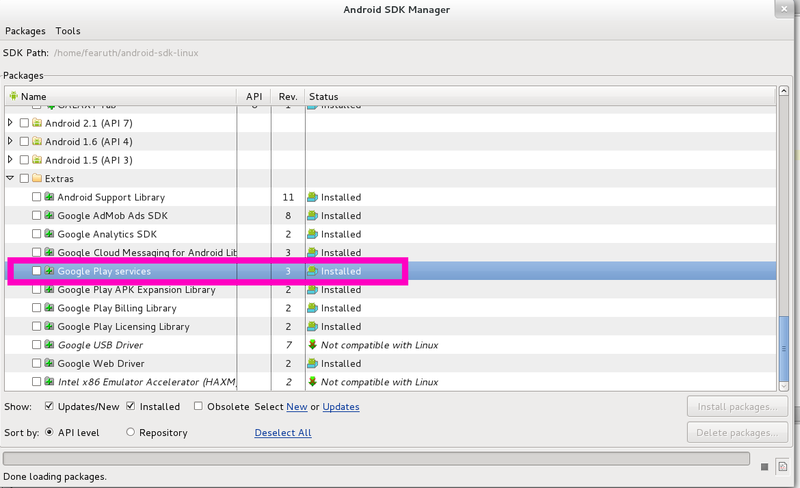 android:required="false" /> // This is required if you want your app to start in the emulator. I set it to false also if map is not an essential part of the application. The following permissions are optional and not required if you just show a map. Try to not use them. in your activity layout (e.g. LinearLayout). In my case I have to clean the project each time I change something in the layout. Seems to be a bug. Step 8: Use Eclipse - Project - Clean. Today I faced with this problem. I used Android Studio 2.1.3, windows 10. While debugging it works fine, but if I update to release mode it does not work. I cleared all proguard conditions, updated, but this was not solution. The solution is related with project structure. The google_maps_api.xml file was different between app\src\debug\res and app\src\release\res. I did manual copy paste from debug to release folder. I then opened the google_maps_api.xml file that automatically gets generated and used the stated link to create a new API KEY. I did all the steps and saved my new key under my current project. I then removed my old registered API KEY as it was no longer required. Under the Manifest file I replaced the old API KEY value with the string shortcut created by this new XML file: android:value="@string/google_maps_key", instead of stating the KEY directly. Finally, remove the new MapActivity, but keep the xml file that was created in that process. Note: By creating the API KEY in this way the Restrictions column, under Credentials, now stated "Android apps". Earlier, when it didn't work the column stated "Android apps, 1 API" or something similar. I do not know if this makes a difference or not. Note: No, that just means that I do not have a specific API selected for this API key (Console -> API key -> Key restrictions -> API restrictions). I guess that both can be used but it's better from the start using the latter. Note: The value stated, in the build.gradle file, under android -> defaultConfig -> applicationId has to match the Package name text under the Credentials page. I solved this error by checking the package name in manifest and app build.gradle. After changed to com.app.triapp in build.gradle, solved my issue. It is probably best to uninstall your app completely from your device before trying with a new key as Android caches the security credentials. A had this error too, you need to: File -> import -> Existing Android Code Into Workspace -> Browse -> Android sdks -> extras -> google -> google_play_services -> lib_project -> google_play_services_lib and OK. Check the project and Finish. I had same issue but it turned out that it was because I created two different map API keys with same SHA-1 fingerprint with nearly similar package name com.bla.bla and the other com.bla.bla.something. I had the same issue. After about two hours of googling, retries, regenerating API Key many times, etc. i discovered that i enabled the wrong service in the Google APis Console. I enabled Google Maps API v2 Service, but for Android Apps you have to use Google Maps Android API v2. After enabling the right service all started working. YOUR ECLIPSE MAYBE CHANGED SHA1 KEY, so you must regen your google key with new SHA1 key in here: https://console.developers.google.com/project/watchful-net-796/apiui/credential After that, copy new key into manifest and reload this google page some times, and your key will be updated, rebuild your project, it will work. P/S: For my error, I deleted .android folder so eclipse regen SHA1. I followed the same step provided in the Google Doc but i was getting the same error. Later i realized that i was signing my app with my app.keystore and the SHA key that i was using to generate the API key was the debug one. So i simply removed the signingConfig signingConfig.generic from by build.gradle file and my map started to work fine. If you issued an api for your release version of the application. Then that api will only work for the release version not for the debug version. So make sure you are using the release version in your phone or emulator . For me, everything was working both in an emulator and on a physical device. However, it stopped working for me when I set up a second machine to debug the same app in an emulator with a newer API level. I did not realize that the fingerprint for that machine changed. After seeing the authentication failure error log in the Device Log I closely compared the fingerprint in my Google Developer Console with the one in the error message. That's when I saw the difference. After adding the new fingerprint to the Developer Console (in combination with the package name) my app started working as expected in the emulator on the new system. So if you set up a new system, check your fingerprints again! Not the answer you're looking for? Browse other questions tagged android google-maps android-maps google-maps-android-api-2 or ask your own question. How can I create an Android application in Android Studio that uses the Google Maps Api v2?